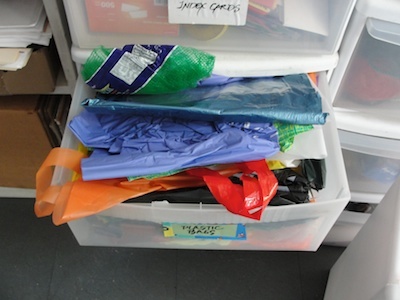 I've been asked how I keep all my materials, especially recycled, organized. It was a matter of necessity as I packed and unpacked materials for workshops. I am so lucky to have space. And a part of that space is filled with stacked plastic slide-out bins. I think the Rubbermaid ones are better but I have a cheaper version from Tom's Discount. I have 24 and used to have even more. 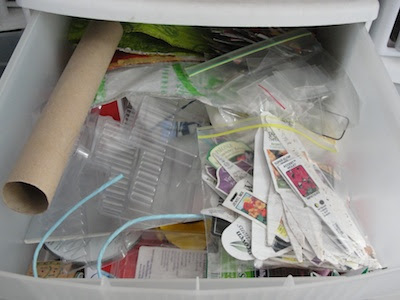 I started with the bins when I was bringing all the paper and materials to my workshops, before these recycling days of paper bags, cereal boxes, and used copy paper. I used to buy paper from a printer pre-cut in specific sizes and had a drawer for each size and sometimes for each color. 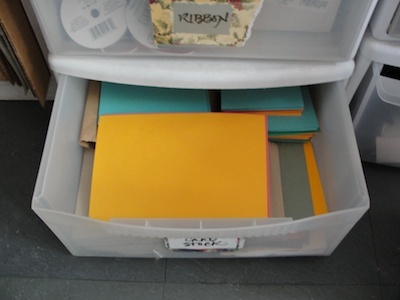 When I first started, I kept the paper unsorted in a stack of boxes from the printer but packing was tedious. My daughter was at a Montessori preschool where there were stacks of bins in the classroom with a bin for each child. I adapted the idea for my studio. I love the Fun with Stencils books with 6 pre-cut stencils in each and reasonably priced. There are ones on Dinosaurs, Flowers, Northwest Indian, Pirates, Egypt, and many more. I've seen them in bookstores, card shops, and toy stores. I order mine directly from Dover Publications, Inc. for the largest selection. I use these most often in family workshops. There are also some patterns I use for specific projects like the ones for the dreidel accordion book which you see here. This drawer has miscellaneous recycled things I'm saving for book projects. 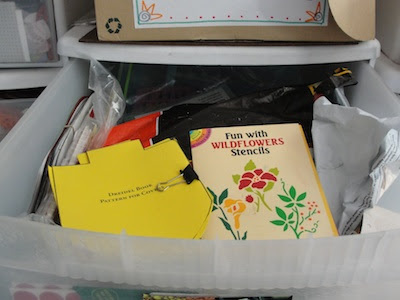 It used to contain rubber stamps but I reduced my collection as I don't bring them to workshops anymore. They make more of a mess and I find that stencils, markers, and collage papers offer inspiration enough. 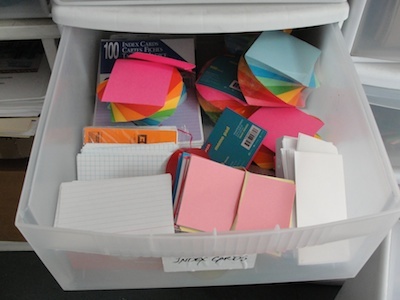 I use index cards a lot for accordion books (directions for Index Card Accordion Book) and keep a selection on hand. Also in this drawer are a bunch of little pads of bright colored paper that I bought on sale at Staples. I think they're a little small for what I had in mind so they may be going into the donation bin. No matter how much I try to bring my own bags, plastic bags do find their way into the house. I keep the nicest colored ones. As of now, my main use is to cut them in strips and and use them for ties but you never know when a new idea might come along. 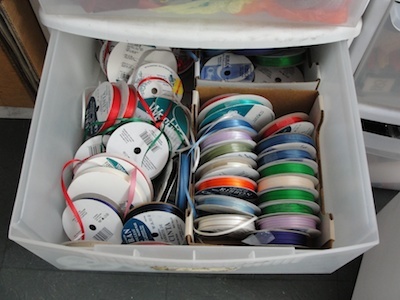 I don't use ribbon as much as I used to but still have a healthy collection. For accordion ties, it is flatter than yarn and makes a more attractive book. This is the last of my collection of paper from the printer.